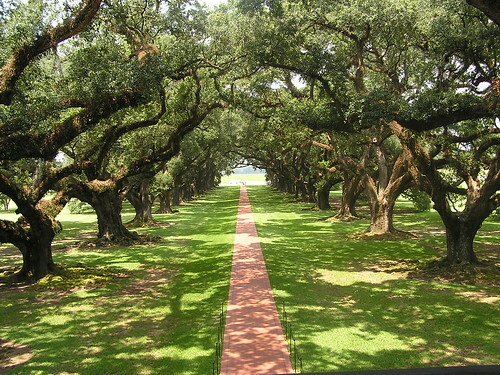 Oak Alley, originally uploaded by Lake Fred. I hope you get to visit that dear city someday. It has a continuing tradition of French perfumery. I hope it's Creole /Southern European/ Caribbean black ambiance will remain as DH and I had known it. There art, music and perfumes were essential and incorporated into life, not considered extras. And the subtropical smells were intoxicating. On one side of the metro area was the muddy overflowing Mississippi, on the other salty Lake Pontchartrain. Bayous and canals snaked through the soft sinking land. The live oaks spread low and wide, hung with moss as chandeliers are with garlands of crystal. The tallest trees were often elegant cypresses and magnolias and they contributed their sublime odours to the heavy misty atmosphere. The scent of cypress in a warmish winter is something one experiences nowhere else except the coastal American South. The humidity traps the smells and intensifies them. I do miss the smell of cypress. I miss the gorgeous water birds such as herons, both blue and white which one saw everywhere by the canals. Hearing their wings beat the air as they flew over my garden on their way back to the nearby park where they roosted at night marked the ends of our afternoons. We had a rose garden with many roses. I grew rosemary, mint, basil and thyme. We also had a Meyer lemon tree and in late spring the smells of citrus blossoms gave forth a sharp rich smell which blended with that of the roses, the herbs, the cypress trees next yard over and the magnolias in bloom down the street. In late spring too, we were getting the last piquant but sweet (sort of apricot like) scents from my two big healthy Tea Olive trees. You know that tea olives are actually chinese osmanthus. Vetiver grass grew along marshes and along roadsides. At least 40 varieties of palms both tall and small were everywhere. What they contributed to the overall smell environment I don't know. The live oaks and their moss, cypresses and tea olives contributed more. The winds blowing mildly off the Gulf of Mexico (which was far down from the river contributed the most subtle kind of saltiness to the air. The lowhanging humidity made all these smells misty and kept them close to all our noses. And we seemed closer to the earth there. The ground is silty and has no rocks in it. It has a combination of a peaty, musty old dirt, and seashell smell to it. It is at the base of the smells I listed above. Thank you for asking me to describe how New Orleans and the surrounding area smelled. I'm going to copy this and store it, because I know for me the smell of New Orleans was a major part of her beauty. Most tourists wouldn't 'get that' as many shortchange themselves by confining their explorations to Bourbon Street, which has a smell of stale beer and booze and foods in garbage bags behind the restaurants. Oh, how I hope you can re-create New Orleans in a bottle! I will be sending you some samples of fragrances from Hove and Bourbon French soon. If certain qualities of Hove's Spanish Moss were combined with Bourbon French's Dark Gift, the result might approach the smell I've described. I think you might be able to do it! What a marvelous, enticing description, Paula. I can feel your love for New Orleans in every line. Where else can you learn about the smell of a place but from another perfumista? Thanks so much. I can't wait to go and sniff the "perfume" of New Orleans now.